Grahamstown born Julia Heemstra who now lives in the USA and has joined hands with the the NGO Waves for Water to donate water purifiers to local schools and clinics. 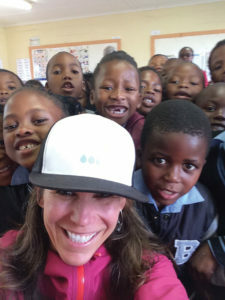 Heemstra is seen at left with with pupils of Samuel Ntlebi. 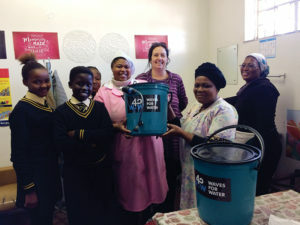 At right, Heemstra is with pupils and cooks at Nombulelo High School who were delighted to receive the filters especially in light of the current water crisis. The dual purpose filters are designed to easily fit on taps or buckets; meaning that the water can be made safe for drinking from multiple sources. Heemstra hopes to secure more funding to continue the project in the near future.